Suceava ([suˈt͡ʃe̯ava]) is the largest city and the seat of Suceava County, in the historical region of Bukovina, north-eastern Romania. The city was the capital of the Principality of Moldavia from 1388 to 1565. Between 1775 and 1918, the city was the third largest from the Duchy of Bukovina, a constituent land of the Austrian Empire, later a crown land in Austria–Hungary (being surpassed by Cernăuți/Czernowitz and Rădăuți to the north), fulfilling the task of a strategic and important commercial border town with the Romanian Old Kingdom. After 1918, along with the rest of Bukovina, Suceava became part of the Kingdom of Romania. Nowadays, it is a significant economic urban centre of the Romanian Nord-Est development region. The city covers two types of geographical areas, the hills (of which the highest is Zamca Hill) and the meadows of the Suceava River valley. The unique setting of the urban settlement includes two groves, Zamca and Șipote, which are both located within the city limits. Burdujeni, one of the neighbourhoods, is connected to the rest of the city by a prominent avenue, which makes the neighbourhood appear to be a separate satellite town. Moldavian chronicler Grigore Ureche presumed the name of the city came from the Hungarian Szűcsvár, which is combined of the words szűcs (furrier, skinner) and vár (castle). This was taken over by Dimitrie Cantemir, who in his work Descriptio Moldaviae gave the very same explanation of the origin of the city's name, however, there are neither historical nor vernacular evidences for this. According to another theory, the city bears the name of the river with the same name, that is supposed to be of Ukrainian origin. In Old German the city was known as Sedschopff, in modern German sources it can be found under such variations as Sotschen, Sutschawa or Suczawa, in Hungarian as Szucsáva (pronounced [ˈsutʃaːvɒ]) or Szőcsvásár, in Polish as Suczawa, in Ukrainian as Сучава (pronounced [sut͡ʃawa]), while in Yiddish as שאָץ' (pronounced [ʃɔts]). During the communist period in Romania, Suceava was heavily industrialized. Suceava is the place of several medieval sites that are closely linked with the history of Principality of Moldavia. The most significant and the best preserved in time is the Seat Fortress of Suceava (Cetatea de Scaun a Sucevei) or Suceava Citadel, a medieval castle situated on the eastern edge of the contemporary city. The fortress was built during the reign of Petru II of Moldavia (1375-1391), also known as Petru Mușat, and then expanded and strengthened during the reign of Alexander I of Moldavia (1400-1432) and Stephen the Great (1457-1504). The medieval castle was part of the fortification system built in Moldavia in the late 14th century, because of the emergence of the Ottoman danger. It became strong enough to hold off an attack by Ottoman sultan Mehmed II (the conqueror of Constantinople), in 1476. Suceava was the capital city of the former Principality of Moldavia between 1388 and 1565. During this period, the castle served as princely residence. Alexandru Lăpușneanu moved the capital to Iași in 1565, so the castle lost its status. After this moment, the citadel entered a period of decline. In 1675, during the reign of voivode Dumitrașcu Cantacuzino, the fortress was destroyed. Then, for over two centuries the castle was deserted. In late 19th century and early 20th century, under the patronage of Austrian architect Karl Adolf Romstorfer, it took place rehabilitation works and archaeological researches. Between 1961 and 1970 other restoration and consolidation works were carried out. In 2013 a major reconstruction program was launched, to return the castle to its original architecture and shape. The Seat Fortress of Suceava consists of two concentric citadels. The inner citadel, known as fortul mușatin, has a rectangular shape and a patio. It was built by Petru Mușat in late 14th century. In the second half of the 15th century, Stephen the Great expanded the structure, by adding another citadel that has a circular shape and surrounds the old one. After 1476, new fortifications were added to the outer citadel. The whole castle is encircled by a large defensive ditch. Today, the fortress is a landmark of Suceava and a touristic attraction. The Princely Court of Suceava (Curtea Domnească din Suceava) was built and developed related with the Seat Fortress. In late 14th century, voivode Petru Mușat built the Princely House, a structure made in wood, which included a cellar. After 1400, Alexander I of Moldavia rebuilt the wooden house and added a surrounding wall made of stone and a complex of buildings, also made of stone. In the second half of the 15th century, the Princely Court was severely affected by fire, the wooden house being completely burned out. During his reign, Stephen the Great (1457-1504) restored the whole complex. A new Princely House was built, this time made of stone, and the other buildings were extended. Vasile Lupu (1634-1653) was the last ruler of Moldavia who took care of the Princely Court. During his time, the cellars were rehabilitated. The complex was abandoned in late 17th century, the buildings and the walls being gradually dismantled. Currently, on the site of the Princely Court there are only ruins and leftovers of the former buildings. The ruins of the former medieval court are located in the city center of Suceava. In the 14th-17th centuries, in the proximity of the Princely Court there were built several churches that still exist today and attract tourists. 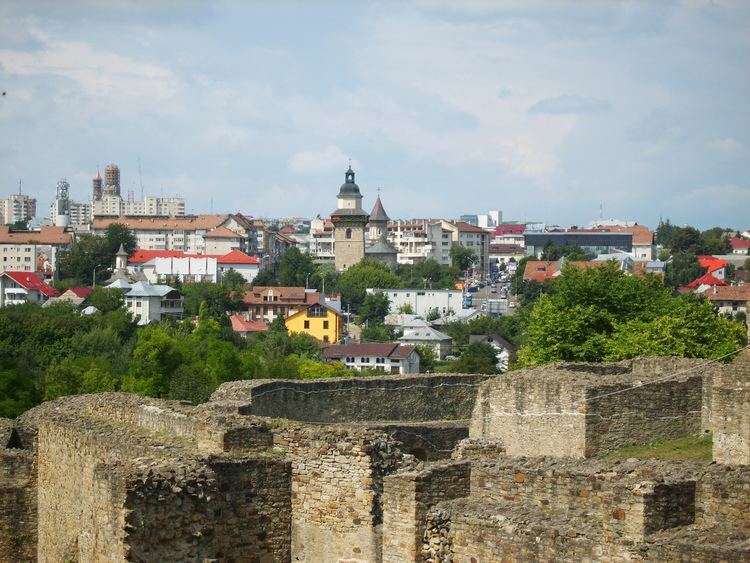 On the north-western edge of the modern city, on a hilltop, there is another medieval citadel known as Șcheia Fortress (Cetatea Șcheia) or the Western Fortress of Suceava (Cetatea de Apus a Sucevei). Unlike the Seat Fortress, currently Șcheia Fortress has left nothing but some ruins. The citadel was built during the reign of Petru Mușat in late 14th century, but was short-lived, because it was dismantled in early 15th century, during the reign of Alexander I of Moldavia. Șcheia Fortress, like the Seat Fortress, was part of the fortification system built in Moldavia in the late 14th century. The first museum in Suceava was opened in 1900, by the initiative of some local intellectuals. In the beginning, the museum included only a few collections that were obtained as a result of the researches and excavation works at the Seat Fortress of Suceava. The museum was expanded and developed over time and became an important cultural institution, currently named Bukovina Museum (Muzeul Bucovinei). It has several departments and administers the medieval sites of the Seat Fortress, Șcheia Fortress and the Princely Court, local museums (Bukovina Village Museum, the history, ethnographic and natural sciences museums), the memorial houses of Simion Florea Marian in Suceava, Nicolae Labiș in Mălini, Eusebiu Camilar in Udești and Ciprian Porumbescu in Stupca, and two traditional houses located in Solca and Bilca. The oldest department of Bukovina Museum is the history museum, which was the backbone for creating a county museum at Suceava. This museum presents the local history of Suceava and Moldavia in the context of Romanian national history. The exhibits of the history museum and the offices of Bukovina Museum are located in a historic building, in the city center. The building, which hosted the prefecture of Suceava County during the interwar period, was built between 1902-1903. Since 1968, it houses the history museum. In 2014, the building and the museum entered an extensive program of modernization, rehabilitation and expansion. At the history museum there is a reconstitution of a scene from the former throne hall located in the Seat Fortress. The scene presents some notable people from the history of Moldavia, made in glass fiber: Stephen the Great (ruler of Moldavia), Maria Voichița (his third wife), Bogdan III the One-Eyed (his son and successor to the throne), officials of that time. The scene chosen to be reconstructed is an allotment of land for peasants. The reconstitution is based on medieval documents, frescoes and archaeological researches. Bukovina Village Museum (Muzeul Satului Bucovinean) is an open-air museum that highlights the traditional cultural and architectural heritage of Bukovina region. It is located in the eastern part of Suceava, near the Seat Fortress. It was founded in the '70s, but its major expansion and development took place after 1990. The museum is designed as a traditional village in Bukovina, containing houses and various objectives from the ethnographic areas of Rădăuți, Humor, Câmpulung Moldovenesc, Dorna and Fălticeni. The museum includes among others a water mill from Mănăstirea Humorului, a traditional blacksmith workshop, a pottery workshop from Marginea and one of the many old wooden churches in northern Moldavia: Church of the Ascension, a Romanian Orthodox wooden church built in 1783 in Vama, a village in Suceava County. The bell tower is also made in wood, and dates from 1787. The church and the bell tower were both relocated in 2001, and currently are part of the museum. Besides Bukovina Village Museum, another museum that reflects the traditional life in this part of Romania is the ethnographic museum. It was opened in 1968 and includes old collections and exhibits that are housed in a medieval inn located in the center of Suceava, known as the Princely Inn of Suceava (Hanul Domnesc din Suceava). This landmark dates from the late 16th century and early 17th century. It was built of stone and has two floors and a cellar. During the Austrian rule (1775-1918), the inn operated as a hunting lodge for the imperial family. Since 1968, it hosts the ethnographic museum. The Princely Inn is the oldest civic building in Suceava which had not been seriously affected by time and maintained its original architecture. The natural sciences museum was founded in 1976-1977, being the newest museum in Suceava. It highlights the flora and fauna of the surrounding area. The museum's rare exhibits and collections are housed in an old building, located in the central park of the city and built between 1811-1814. In the past, before being an attraction for visitors, the building operated as a school for boys. Along with all these museums, Bukovina Museum includes memorial houses of some writers and artists born in this area of the country. The memorial house of Simion Florea Marian (Casa memorială Simion Florea Marian) is the only one located in Suceava, the other ones being in the surrounding area. The memorial house operates as a museum. It was opened in 1974 in the home where Romanian priest and writer Simion Florea Marian lived, from 1884 until 1907, when he died. The museum hosts a collection that contains over 10,000 volumes, over 450 collections of magazines and newspapers, of which 150 are from Bukovina, manuscripts, letters, cultural and historical documents, old photos. In front of the memorial house it was opened a small park with a statue dedicated to Simion Florea Marian. One of the most important cultural sites in Suceava is Saint John the New Monastery which includes the monumental Church of Saint George built between 1514 and 1522. The construction began during the reign of voivode Bogdan III the One-Eyed of Moldavia, after the nearby Mirăuți Church (the metropolitan cathedral of Moldavia at that moment) was devastated in 1513. The construction was completed by Stephen IV of Moldavia (also known as Ștefăniță). The monastery church served as metropolitan cathedral of Moldavia until 1677. It has frescoes painted on the outside, typical of the region, and is one of eight buildings that make up the churches of Moldavia UNESCO World Heritage Site. Since 1991 Saint John the New Monastery serves as the cathedral of the Archdiocese of Suceava and Rădăuți. Saint John the New was a Moldavian monk who preached during Turkish occupation and was subsequently martyred in Cetatea Albă, present-day Bilhorod-Dnistrovskyi in Ukraine. Alexander I of Moldavia brought his relics to Suceava in 1402. Mirăuți Church, dedicated to Saint George, is the oldest religious building in Suceava, founded by Petru II of Moldavia in late 14th century, in the same period with the Seat Fortress, when he moved the capital from Siret to Suceava. The church established the city as a see of it. Mirăuți was the metropolitan cathedral of Moldavia between 1402 and 1522, when the church of Saint John the New Monastery was completed. In 1402 the relics of Saint John the New were transferred to this church from Cetatea Albă, and then, in 1589 transferred again to the nearby monastery church by voivode Peter the Lame. The name Mirăuți derives from the fact that it was the coronation church of Moldavia until 1522. Stephen the Great was crowned in here in 1457. After the church was devastated, it was rebuilt in early 17th century, and then, in the 18th century, abandoned. Church of Saint Demetrius was founded by Peter IV Rareș, ruler of Moldavia (1527-1538, 1541-1546), and the son of Stephan the Great. The church was built in 1534-1535, with a bell tower added in 1560-1561 by Alexandru Lăpușneanu. The bell tower is 40 meters high, being the tallest bell tower in Suceava and a landmark of the city. The church had frescoes painted on the outside, that are still visible on one side wall. The frescoes inside were restored recently. Church of Saint Demetrius is located near the ruins of the former Princely Court of Suceava. Furthermore, there is another old church near these ruins. Church of Saint John the Baptist, also known as Coconilor Church or Domnițelor Church, was founded in 1643 by Vasile Lupu, voivode of Moldavia between 1632 and 1653. It has no exterior frescoes and a short bell tower that has its roof linked with the roof above the church. In its early days, the church functioned as a chapel for the Princely Court. Church of the Resurrection (located in the proximity of Saint John the New Monastery) dates from 1551, and was founded by Elena Rareș, the wife of voivode Peter IV Rareș. The church has no tower above the naos, its architecture reflecting the urban style of the medieval period. Instead of the bell tower, the church has a zvonnitsa, an architectural form especially used in the Russian architecture of the 14th-17th centuries. Church of the Resurrection was used by the local Roman Catholic community during the Habsburg occupation, and then by the Ruthenian Greek Catholic community, until 1936. It is also known as Văscresenia Church or Elena Doamna Church. Church of Saint Nicholas (Prăjescu) is another religious building in Suceava that features the medieval Moldavian architectural style. The present church was rebuilt by treasurer Nicoară Prăjescu in 1611, during the reign of Constantin Movilă (1607-1611). Throughout its history, the church functioned as a necropolis for the local boyars. Between the city center and Ițcani neighborhood, on the slopes that descend to Suceava River valley, there is Church of the Assumption, another old Romanian Orthodox church, founded in the first half of the 17th century (1639). The church was built on the place where Ițcani Monastery existed before. It functioned as a nunnery until late 18th century. Today it is parish church, and has a zvonnitsa similar to that of Church of the Resurrection, located downtown. In Burdujeni neighborhood, 4 km (2 mi) north-east of the city center, there is Teodoreni Monastery, founded in 1597 by local boyar Teodor Movilă, the elder brother of Ieremia Movilă, ruler of Moldavia (1595-1600, 1600-1606). Burdujeni village (now a district of Suceava) was established and developed around this monastery. The set of buildings includes Church of Ascension, the bell tower, living quarters for nuns and a surrounding wall. Just 1 km (0.6 mi) north of Teodoreni Monastery, in the old district of Burdujeni, there is Church of the Holy Trinity, founded by archimandrite Filaret Scriban in 1851. Ițcani neighborhood has two Romanian Orthodox churches founded in the first half of the 20th century: Church of the Holy Archangels (built near Suceava North railway station, in 1933-1938) and Church of the Holy Apostles (located on European route E85 and built in 1905-1908 by the German community of Ițcani, initially as a Lutheran church). Church of the Holy Cross, located in Pătrăuți village (a few miles north-west of Ițcani), was founded in 1487 by Stephen the Great, and is one of the monuments that make up the churches of Moldavia UNESCO World Heritage Site. Also not far away from Ițcani, there is Dragomirna Monastery, established by clergyman Anastasie Crimca in 1609. Voroneț Monastery is located 40 km (25 mi) west of Suceava, in the town of Gura Humorului. During the late Modern Age until the mid 20th century a sizable German community lived in Suceava. They were of both Roman Catholic and Evangelical Lutheran faith given the fact that they had a diverse geographic background. Several religious buildings that served for both aforementioned categories can be still found today both in the city proper and in the Ițcani neighborhood. Suceava had an important Armenian community which is highlighted by several religious buildings that still exist today. The most representative landmark established by the local Armenians is Zamca Monastery, a fortified complex of buildings located on a plateau at the western point of the contemporary city. Zamca Monastery was constructed between 1551 and 1606 and its church is dedicated to Saint Auxentie. Along with the church, the monastery includes several buildings made of stone and a defensive wall that surrounds the whole medieval complex. Between Zamca Monastery and the city center there are two more Armenian Orthodox churches. Church of Saint Simon (also known as The Red Tower Church because of its bell tower) was founded in 1513. The bell tower was constructed in 1551. The church has an old Armenian cemetery in the proximity and a chapel that was built in 1902 (Pruncul Chapel). Church of the Holy Cross was established in 1521 and was renovated several times in its history. The Armenian parsonage is located near the church, along with several old tomb stones. Hagigadar Monastery is another medieval complex built by the local Armenians. It was founded in 1512-1513, and is located on the south-western proximity of the city, on a valley near European route E85. Colegiul de Artă Ciprian Porumbescu (Ciprian Porumbescu Art College) is a high school which is hosted in a historic building, built in 1859, in the city center of Suceava. The building had several destinations in the past: Suceava Town Hall (until 1904) and Școala primară română de fete (Primary Romanian school for girls). Romanian jazz singer Anca Parghel taught music for a living in Suceava at this local Arts high school before turning to a professional singing career in 1989. Gara Suceava Nord-Ițcani (Suceava North railway station, also known as Ițcani) is a train station built in 1871 in the village of Ițcani (today district of Suceava). Between 1871-1918, it was a train station at the Austro-Hungarian border. The historic building of Ițcani railway station was built in the Gothic style of the Central European railway stations of that period. Palatul de Justiție (The Palace of Justice) is a historic building which was built in 1885 to serve as the seat of Suceava Tribunal and Court. The building has four sides and a patio, and was designed by Viennese architect Ferdinand Fellner. Later, during the communist regime, the city hall was moved in this palace and operated here until 2000. Spitalul Vechi (The Old Hospital) is a complex of buildings built between 1891-1903 which originally hosted the district hospital. The hospital ensemble consists of four pavilions of historic value and was built in the southwestern end of Suceava, in Areni neighborhood. In 1964 a new hospital building (known as Spitalul Nou) was inaugurated nearby. Colegiul Național Ștefan cel Mare (Ștefan cel Mare National College) is the oldest and most prestigious high school in Suceava County, established in 1860. The baroque style building which houses the high school was built between 1893-1895, downtown Suceava, and today is considered a historical monument. Gara Suceava-Burdujeni (Suceava railway station, also known as Burdujeni) is a train station built between 1892-1902 in the village of Burdujeni (today district of Suceava). Between 1902-1918, it was a train station at the Austro-Hungarian border. The historic building of Burdujeni railway station was built in the architectural style of Fribourg railway station, located in Switzerland. Palatul Administrativ (The Administrative Palace) is a historic building which was built between 1903-1904 to serve as the seat of Suceava City Hall. The building originally had only two sides of the four current sides, and was designed by Viennese architect Peter Paul Brang. It was designed in the baroque style. Currently, the palace houses the prefecture and the county council of Suceava County. Casa Polonă (The Polish House) is a building made between 1903-1907 by the Polish community in the city of Suceava. The building was designed by architect Alojz Friedel. During the communist regime, The Polish House was nationalized, and since 1954, it housed Ansamblul Artistic Ciprian Porumbescu (Ciprian Porumbescu Artistic Ensemble). In 1984 the building was restored, and then hosted a local theatre, until 1990. In 1996, the building was returned to the Polish community of the city. Uzina de Apă (The Water Plant) is a set of industrial heritage buildings, designed in 1908 by engineer G. Thiem from Leipzig and built between 1910-1912. The water plant operated in these buildings between 1912-1960, and then it was moved into a modern building. In 2012, in celebration of 100 years since its establishment, in the former water plant buildings there was inaugurated the Centre for Architecture, Urban Culture and Landscape in Suceava. Biblioteca Bucovinei I.G. Sbiera (I.G. Sbiera Bukovina Library) is the first public library in Suceava, inaugurated on 12 December 1923. It is also the largest library in Suceava County, with over 350,000 bibliographic units. Currently, the library is hosted by two historic buildings located in downtown Suceava and built between 1925-1926, respectively 1929-1930. The County Forestry Department in Suceava is an institution which operates in a heritage building located in Areni neighborhood, in the city of Suceava. The building dates from the first half of the 20th century. The Unions House in Suceava is a heritage building, located in downtown Suceava, which houses the unions offices, along with some shops. The building is also known as Samuil Isopescu House. Casa Costin Tarangul (Costin Tarangul House) is a heritage house dating from the 19th century (1886). The building is located next to Simion Florea Marian Memorial House, in the center of Suceava. Casa Ciprian Porumbescu (Ciprian Porumbescu House) is a heritage house dating from the 19th century, where Romanian composer Ciprian Porumbescu lived and created some of his works. The house is located in Prunului street, downtown Suceava. School No. 5 Jean Bart in Burdujeni (Suceava) is a school built in 1902 in the village Burdujeni, today a town district of Suceava. The building that houses the school has historic value. School No. 6 in Burdujeni-Sat (Suceava) is a school built in 1911 in the village Burdujeni, today a town district of Suceava. The building that houses the school has historic value. Former Burdujeni Town Hall in Suceava is a building that was built in 1902 in the village Burdujeni and initially was the town hall of the locality. In 1926 Burdujeni became a district of Suceava, and so the town hall was abolished. The historic building currently houses the headquarters of Electrica company. Near the fortress, in Șipote-Cetate Park, there is an equestrian statue of Stephen the Great, designed and made by the local sculptor Iftimie Bârleanu in 1977. The monument has 23 meters in height, being the tallest equestrian statue in Romania. In the city centre there's also a statue dedicated to Petru Mușat, Prince of Moldavia between 1375-1391. 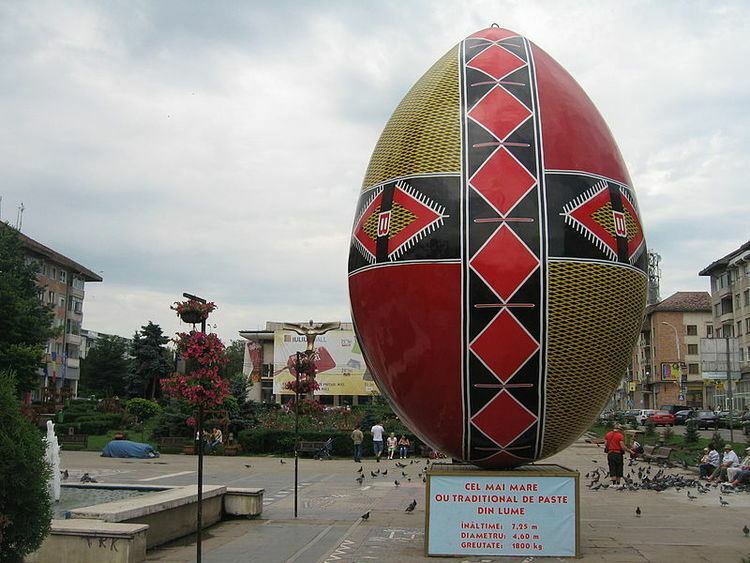 In the past few years Suceava started to evolve more rapidly. The most important sights in the town date from its time as a princely capital (i.e. the Middle Ages). There are numerous museums in the city including the Bucovina History Museum, the Bucovina Village Museum, the Bucovina Ethnographic Museum (housed in an inn from the 17th century), or the Natural History Museum. ACS Foresta Suceava is the football team that currently represents the city of Suceava in the second tier of the Romanian football system, namely in Liga II. In the past, Suceava also had other significant football clubs competing in either Liga I or Liga II (depending on their level of performance) such as CSM Suceava, Cetatea Suceava or Foresta Suceava (the latter one being initially based in the city of Fălticeni from the same county). The city also used to have a Liga III side Sporting Suceava, but the club had subsequently went bankrupt. All the major sporting events are hosted on the Areni Stadium, a multi-purpose stadium in Suceava. It is currently the home ground of ACS Foresta Suceava and can hold up to 12,500 people. The stadium was initially opened in 1963 as the "Municipal Stadium". The main university of the city (and also of the entire county) is the Ştefan cel Mare University of Suceava established in 1990, which has 10,138 students to date. Main study offers are: Social Sciences, Mathematics and Informatics, Philology. Main study offers are: English, Philology, Mathematics and Informatics. Main study offers are: Natural Sciences, Mathematics and Informatics. Named after the twice Prince of Moldavia and the famous writer of the Descriptio Moldavie, Dimitrie Cantemir. It is the only economics high-school in Suceava. Main study offers are Tourism, Gastronomy, Alimentation, Economy, Countability and Trade. The main profile which the school promovates is the Technical profile. Suceava is served by the Suceava International "Ştefan cel Mare" Airport (SCV), located 12 km (7.5 mi) east of the city centre, it is also called "The Suceava Airport".